Our Sweet Tasting 8 to 10 oz. 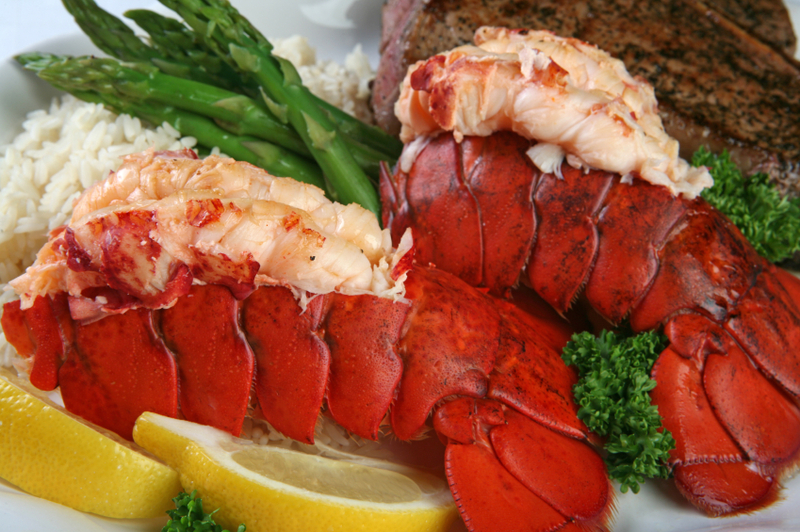 Extra Large Size Maine Lobster Tails are so easy to prepare, baked, stuffed, steamed, or on the Grill! There are FOUR lobster tails in this package. Several years ago, we started having grilled lobster tails, shrimp and scallops with mushroom risotto for our Christmas dinner. After a couple of years of sourcing locally which usually meant going to more than one store, I shifted to The Lobster Guy. 3rd year running now, and barring unforeseen circumstances, I'm a customer for life. This is our third order of lobster tails from The Lobster Guy in the past two years and we are very pleased with the quality and shipping, on time, with each of our orders. We will continue to order from them. Thank You & Merry Christmas and Safe New Year! you last week, and as soon as I unwrapped them I knew we were in for a treat. frozen this bunch of jaded foodies has ever enjoyed. The vote was unanimous. This was our pre Christmas feast and it was spectacular!! wrapped to preserve them. You have my business forever. Great job of packing and shipping. Lobster tails arrived on time and were excellent that night after grilling them. They have a wide variety of seafood options, and I would highly recommend them for special occasions. We order al the time form seafood companies online. This was our first time with the Lobsterguy, and it was the first of many to come! The detail and quality of this company is not something you see online everyday! We are hooked! They even send you a handwritten card, signed by the staff, and even a note from the packer Andrew! Can you say attention to detail? Most online company's give you a generic computer print out, these folks actually take the time to make your order personable! Impressed Impressed Impressed! Everything was received on time and was very good. All I can say is wow! It was all GREAT! We will be ordering again and again! We got Lobster tails, and the filets and some chowder. The meat was beyond excellent, the chowder was some of the best ever, and the Lobster was over the moon! You have a regular customer for life! Received an order of 12 ( 8-10 oz.) Maine lobster tails. I broiled them and served on Christmas Eve. They were the best lobster tails I (we) have EVER eaten!!! The meat was tender, sweet and had perfect firmness, everyone raved about them!!! Great product, great price....FABULOUS!!!! Thanks again for making our Christmas Eve festivities that much more special!!! PS: Your packaging, by Julio, Thank You greeting card from Amanda, and cooking instructions/booklet added a nice touch...I knew I was off to a good start when they were included in the package!!!! Best Lobster Tails and the best prices anywhere! the lobster tails arrived last Friday as promised. The taste was "out ofthis world"! We enjoyed the meal and will definitely order more delicious food from you!